The ‘last breakfast’ at the hotel before we leave to start our climb. Slept okay in my little lodge which was nice; I did however get tangled up in the mosquito netting in the middle of the night when I got up to use the loo. Lots of chatter and worries in the group about Kitbag weight. Everyone sneakily tests each others bags on the front steps of the hotel all pulling faces believing their bag is heavier! With the ‘Weigh in’ done (and passed somehow!) everything is loaded on to the bus while we watch some monkeys frolic in the trees above. After a couple of hours of navigating the Tanzanian highways, a stop for snacks and water and a stop for a Police check point, we reach the real “African roads”. Another couple of hours of bone jarring, filling loosening travel through the amazing sights of the Forest – acres of eucalyptus trees, potato and carrot fields – we reach Londrossi Gate. Here we have packed lunches and sign the book to register that we have started our climb up the mountain. Unfortunately “system problems” meant we had a 3 hour wait at Londrossi Gate watching all the other groups leave to start their climbs as we lounged around in the sun waiting for something to happen. Eventually all was sorted and we set off on a quick drive to our starting point (Lemosho Gate) where we enjoyed a relatively brief two and a half hour walk through the forest to the first nights camp. For such a short walk it was quite eventful – Margaret experienced the stinging nettles, we saw Colobus monkeys and I managed to rip a pair of shorts from the rear of the waistband all the way down to the hem of the right leg. Arse. We reached camp just as the sun was setting. I quickly changed out of my holy shorts and we all enjoyed our first camp dinner together before retiring to our tents to prepare for the next day. 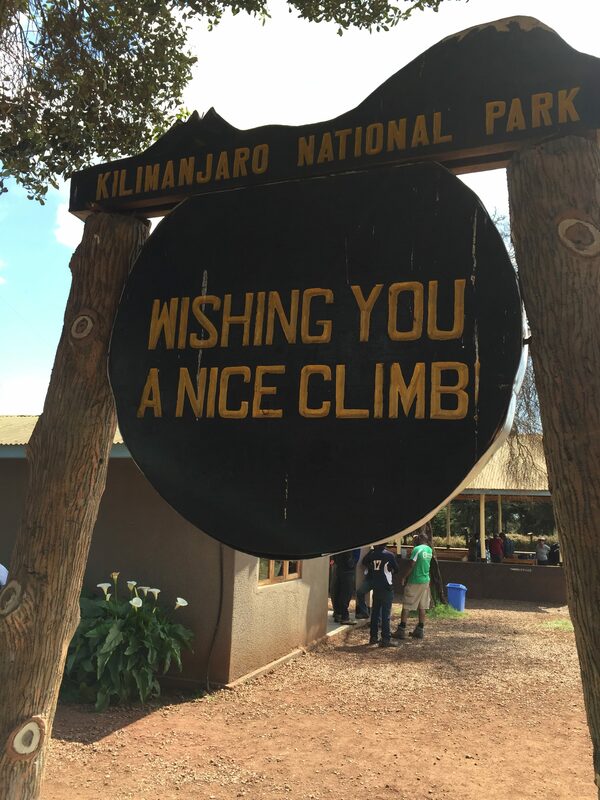 Previous post: Leaving on a jet plane…for Kilimanjaro!